Passport, in original, with a minimum validity of six months as on the date of submission of application for visa. The passport should have at least two (2) blank pages. Copy of the passport ( Page no 2 & 3 ) should be attached. All old passports must be submitted with the application form. One recent (not less than 3 months old) passport-size colour photograph depicting full face with white background. Proof of Profession: Certificate from the employer. In case of students, copy of Identity card from the educational institution is to be attached, for retired person need retirement papers . Proof of Financial soundness: International travel card like SBI Travel card / updated bank statement (last 3 month) / endorsement of foreign currency equivalent to US$150/- per applicant ( Endorsement should not be older than 1 (one) month at the time of submission), International credit card with running year endorsement in the passport. * Fake dollar endorsements will be treated as the reason of visa rejection of the visa application. 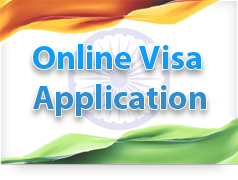 Online Visa Application form which has BGD Registration No. Applicants would be required to scan and upload their photograph in the designated space provided in the online application form. Applicants must make sure that their date of birth & place of birth in the current passport matches with the one in the old passport, NID card and / or birth certificate. All old passport must be submitted on the date of submission , without all old passport application will be treat as incomplete. Bangladeshi passport holder all categories of Indian visas are accepted on a walk in basis. The application form should be submitted at the IVAC center within 8 days of filling up the form. Remarks : Normally issued for a period of stay in India upto 90 days for the purpose of tourism/ meeting relatives/ pilgrimage etc. Remarks : Issued to persons whose children are studying in India and dependents of persons employed in India or any other categories of persons requiring long term stay in India. Remarks : Persons transiting through India by land/river to a third country will be issued transit visa subject to production of ticket and valid visa for the third country. Documents required : General documents alongwith copy of a confirmed ticket plus visa for the third country.Copy of Hotel booking. Remarks : Double entry transit visa will be issued to Bangladeshi nationals travelling by air subject to stipulation that period during each stay should not exceed 72 hours and they should possess confirmed return tickets. Documents required : General documents plus presentation of confirmed tickets.Copy of Hotel booking. Remarks : Persons visiting India to get medical treatment. Documents required : General documents and (i) Medical certificate, in original, from recognized hospitals/ doctors indicating in detail the medical condition of the patient; (ii) Recommendation from the attending doctor for availing treatment abroad in case of first visit; (iii) recommendation from the attending doctor in India in case of continued treatment in India; (iv) In case of hospitalization or long term treatment, proof of financial resources, as indicated below, may be sought: (a) Bank statements for last 6 months. (b) Solvency certificate from Bank. Remarks : The applicant should submit visa application along with full particulars of field of Research at least one week before his travel to India to take up the work. Remarks : Individuals invited to attend events/seminars/conferences in India. Agreement Letter & Job Offer Letter. All legal documents of Employer. Remarks : Professionals who have been offered employment in India. Documents required : General documents and (i) a copy of the appointment letter from the Indian firm; (ii) a letter addressed to the Visa Section, High Commission of India, Dhaka from the employer in India; (iii) testimonials of interview in India; (iv) copies of press notification in India regarding the post; (v) if the person is employed in Bangladesh, a letter from the present employer is also necessary; (vi) Persons traveling to India on Employment Visa are required to register themselves with nearest FRRO. Remarks : To attend various training programmes in India. This is to inform that all requests for additional route endorsements on valid visas will now be accepted at all Indian Visa Application Centres (IVAC) across Bangladesh w.e.f. 22nd November 2018. 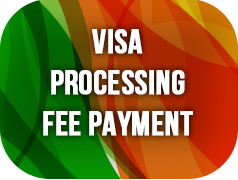 The processing charges of IVAC for this service will be BDT 300. 2. All IVACs will have a separate counter to facilitate submission of applications for route endorsements. An applicant can request for two additional routes, in addition to existing 24 international airports and Gede/Haridaspur rail and road route. The forms are available on the website of the High Commission of India( https://www.hcidhaka.gov.in/pdf/endorsementofportapplicationform.pdf) and the Indian Visa Application Centres ( http://www.ivacbd.com/Other-Forms). 3. High Commission of India, Dhaka or the Assistant High Commissions in Chattogram, Rajshahi, Sylhet and Khulna will no longer accept applications for additional route endorsements. 1. Please submit one passport size photograph along with the application. (Paste the photograph on the application). 2. Please mention the phone number in the application form. 4. If travelling in a group or with family, then all names of the group/family members should be filled up against Point 19 of the application form. 6. Copy of the passport has to be mandatorily attached with the application. 7. Date of arrival and date of departure has to be clearly specified in the application. 3. Please mention the specific place to be visited against point 14 of the application form : Eg. Gangtok and not only Sikkim. 6. Copy of the passport and valid Indian Visa issued has to be mandatorily attached with the application. 7. Date of arrival and date of departure has tobeclearly specified in the application. 8. (From 4th December 2018 onwards) Please submit your passport along with the application for permit at theIndian Visa Application Centre (IVAC) at Floor – G1, South Court, Jamuna Future Park, Progoti Sharani, Baridhara, Dhaka-1229 between 09:00 AM to 01:30 PM.